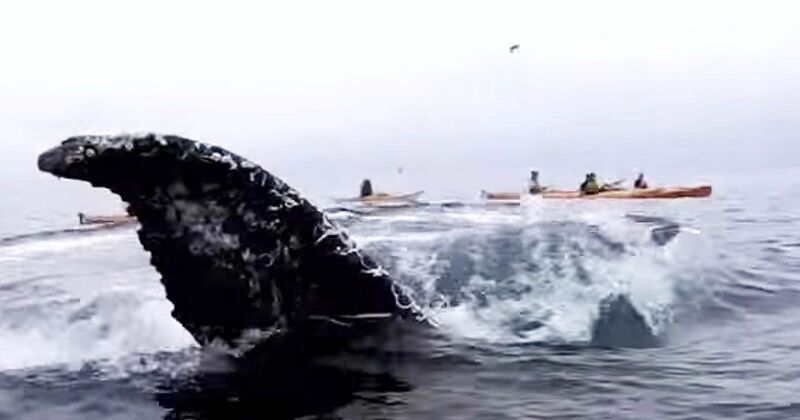 A humpback whale got a bit too close for comfort with a kayaker off of Monterey Bay in California - and the entire encounter was caught on video. Cimeron Morrissey posted the viral video on YouTube where it's been viewed more than 6 million times. In the footage, Morrissey is kayaking in a group that she says was trying to check out the nearby raft of sea lions. Unexpectedly, that's when a giant humpback came up about 10 feet from her kayak, "Humpbacks are graceful and fully aware of their size and of their surroundings, so I wasn't scared (at first) but I was certainly shocked that he chose to swim right up to me." The kayaker explained in her YouTube caption. But the encounter didn't end there - Morrissey goes on to explain what happened as the whale arched it's back, "Then his enormous barnacle-encrusted tail came out of the water and was about 12 inches from my face, which pretty much made my eyes pop out of my head." This is the most exciting, and scary part of the video. Morrissey looks extremely small in comparison to the giant whale - National Geographic explaining that these creatures can grow to be anywhere from 48 to 62 feet in length. WTVR mentions that one of the most important lessons out of this video is the fact that you shouldn't ever swim, or kayak towards humpbacks on purpose - as Morrissey points out. "We were NOT kayaking toward the whales and it is not advisable - nor is it legal - to do so. It's important to respect whales and just let them be." Check out the incredible video here below. But be warned, Morrissey does swear when the whale unexpectedly flaps its tail just inches from her kayak.